Over the years the focus of my entertaining has been mostly on the main course and the dishes around it – salads, appetizer and veggies etc. Generally I spend so much time concentrating on these dishes that the dessert takes a back seat. More often than not, I pick up a few sweets from an awesome bakery or even skip dessert all together, and just serve a sweet wine or a bit of fruit. Sometimes however, I just really want to serve a beautiful dessert that comes from my own kitchen. Today’s recipe is perfect for cooks like me, or those who don’t have much time to make something more elaborate. You can pull some gingersnaps out of the freezer and whip up the lemon curd in about 10 minutes, and voilà, you have a scrumptious, homemade dessert. This recipe for lemon curd is the nicest one I have ever made. It has the zest of 2 lemons and the juice of an orange, which ramp up the flavour to a perfectly intense level. The vivid yellow colour comes from the free run eggs that I use. The yolks are virtually a bright orange colour. I have also recently learned that different varieties of oranges have subtly different flavours. I used Cara Cara oranges in this recipe, so the flavour is influenced by them. You could change up the flavour of your curd, by changing the kind of orange that you use. You could use store bought gingersnaps, but I used my homemade 3 Ginger Gingersnaps from last week’s post as I couldn’t find gingersnaps in the store. The recipe for the lemon curd comes from Chef Ginette Ziemnicki, the teacher of the pie course I recently took at my fave kitchen store, Posh Pantry. I am bringing this dessert over to Angie’s Fiesta Friday! I am pretty sure that the gang there will like it! For any of you who haven’t yet visited this crazy Friday blog party, come and join us – you really don’t want to miss out on the fun! And this Friday is shaping up to be a very wild one!! The witty Saucy and wild Johnny will be co-hosting! I don’t know who is tending the bar, but I am getting there early to get a jump on the martinis before the line-up gets too long!! This is a very thirsty bunch 😀 ! Mix the cornstarch, sugar and lemon zest in a medium saucepan. Stir in the lemon juice. Top up the orange juice with water to total 200 ml. and add to the pot. Cook over medium heat, stirring constantly, until thickened and smooth. Remove from heat and beat in the butter until melted. Beat in the egg yolks and egg quickly so that the eggs don’t cook. Return the curd to a medium heat and stir vigorously until the mixture begins to bubble once again. Remove from the heat and allow to cool at room temperature. Can be refrigerated once it is cooled. Just place Saran Wrap on the surface of curd to prevent it from forming a skin. Crumble some of the gingersnap cookies. Place some of the cookies crumbles in the bottom of small dessert cups. Top with some of the lemon curd. Make as many layers as you like, ending with the lemon curd. Garnish with a few cookie crumbles and a chunk of candied ginger. Serve immediately with a big smile! Some of my favorite flavors here! These are beautifully assembled and that bright yellow color really pops. 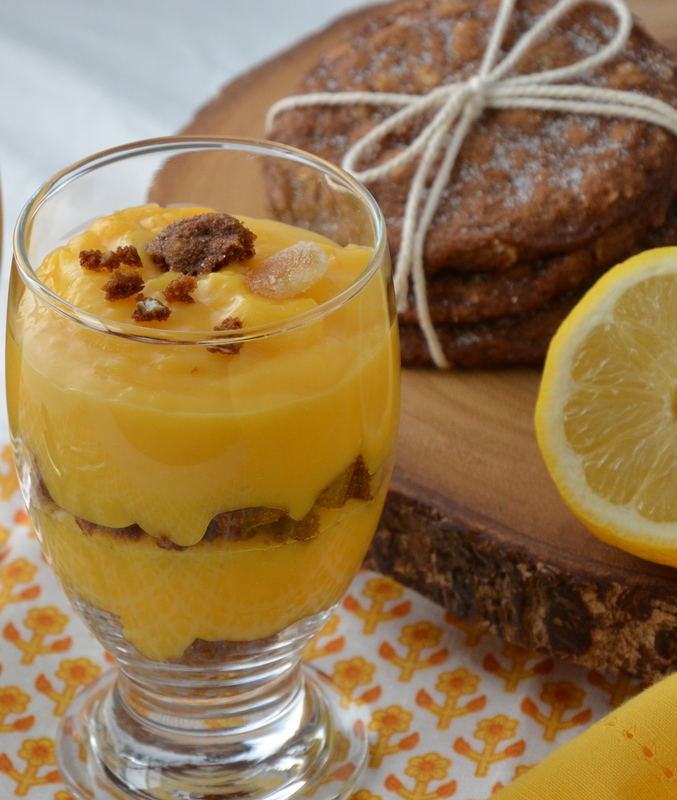 I made lemon curd for the first time this year and loved adding leftovers to toast or over yogurt – this looks like a sublime way to highlight it, with those tasty crisp gingersnaps! Beautiful presentation! I do love the color and flavor of free run yolks. I agree – they definitely taste different. I like them over easy with some crusty bread for dipping! I want some right now, in fact. Absolutely lovely! Your eggs must have really bright red-orange yolks, this is seriously the most vibrant curd I’ve ever seen! I’ve made a fresh ginger cake with a super-tangy lemon glaze, it was gone pretty quickly. Your dessert has similar flavours so I know I will adore these!! OMG, Saucy, check out those moves!! That man is smooth 😎 Now he knows how to shake it! But glad you are in charge of shaking the cocktails 😀 I am arriving a little late, but I hear that whatever you are mixing is pretty darn fine, so I’ll have one too! Had no idea he could shake like that, hahaha… We should call him Sir Shake! I guess he had been dubbed then! 😉 LOL! I’ve never made a homemade lemon curd…I never knew it was this easy. Shame on me! And here you are, taunting me with your gingersnaps again! Oh, I need to make this… Looks delicious! The bar is overflowing with drinks, Julianna, have no fear! Though I’m thinking once I have a taste of your lemon curd and gingersnaps, I won’t need anything else. These look beautiful and sound great. I especially like the presentation in the dessert goblets. Have a great Friday and weekend! Pheww! so glad to hear it….Hmmm you have given me an idea! Maybe I could design a lemon, ginger martini? I think I will turn this project over to my hubby – he’s much better on the bar, than me 😎 So glad you like the presentation, Ngan! Have an awesome weekend! What a beautiful composition :). This looks fabulous, Julianna! Lemon curd and gingersnap are two things that I very much love, but I had never thought to combine them together! Fantastic recipe here. These look fabulous Julianna. Love a quick dessert anytime! Love the pairing of the lemon curd with gingersnap cookies! Happy Fiesta Friday to you! I’m on a lemon kick right now, and this looks amazing! Sounds like a wonderful dessert for spring and summer! Oh yum! 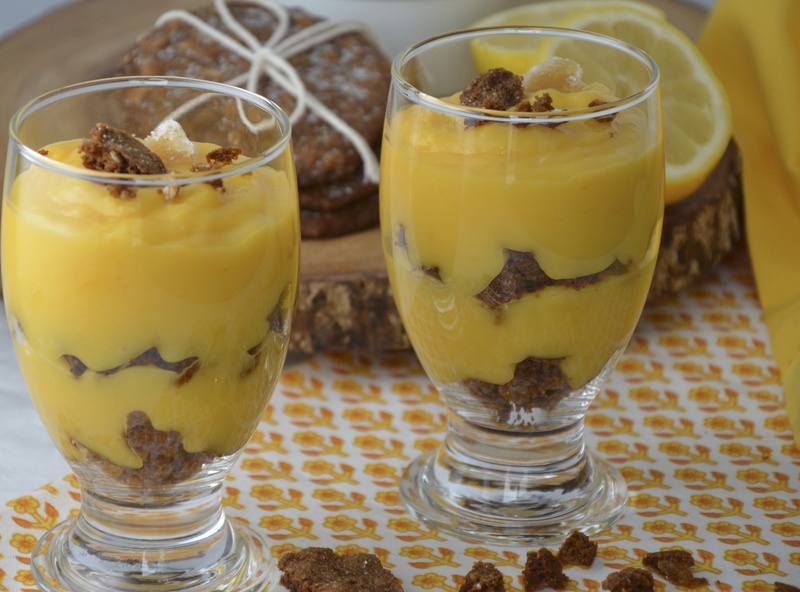 Gingersnaps and lemon curd- can’t go wrong with this combination of ingredients. Looks so so good! Julianna- amazing! I really want to try making some lemon curd….I had never heard about it until recently. Sounds really delicious! Super Yum! I love intense lemony goodness!!! One of my favorite flavors!! No JuJu it’s all gone, but for you I will whip up another batch! It only takes a few minutes and I want some more too! 😀 You have an awesome weekend too! I believe Gingersnaps are quite possibly my favorite cookies… this looks delicious! This looks delightful!! I’m running late to Fiesta Friday this week so please save some for me! I will be trying this! Thanks for sharing, looks amazing!!! Awesome, I hope you do! Please let me know what you think! Thanks Patty! Oh, we buy these amazing eggs called “River Run”. The yolks are so vivid! I should take a picture the next time I use them and just post it so you can see! Amazing! This is something that I’ve yet to make, as I’m like you in focusing on savoury over dessert. Which is why I’m trying to bring sweet stuff to F&F most weeks. Doesn’t always work! Oh well. Back to this recipe, as I like the inclusion of the orange. And I’m now wondering if it would be possible to use grapefruit as well. Hold on a sec, Wild Johnny?! Hahaha! If only you knew. And if only I knew who’s been gossiping! Back to the dessert! I think you could make an awesome grapefruit curd. For that matter, I think I will try it the next time and I’ll let you know how it comes out! 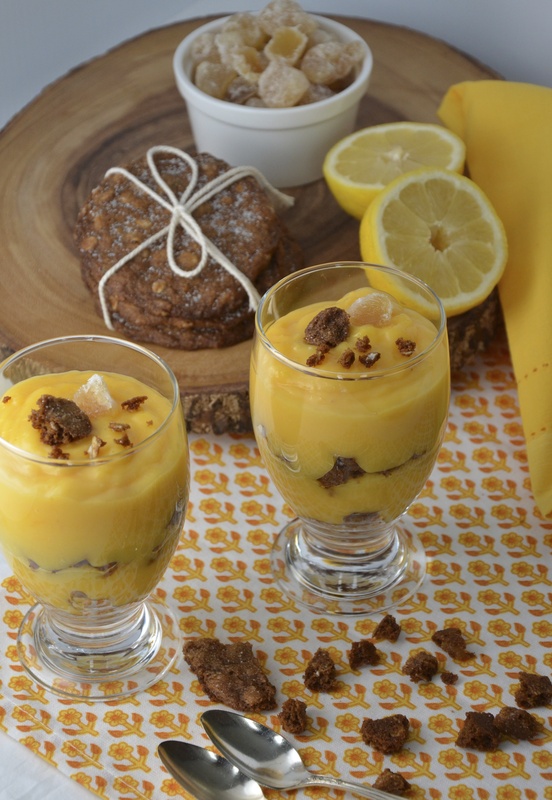 Wow, this looks like such a lovely dessert Julianna & love the vibrant color of that lemon curd! The combination of the lemon & ginger flavors, yummy! Yes, I love the subtle difference that the orange makes! I also add one orange to my lemon curd. i think it gives a more complexe flavour and a deeper yellow colour. Your is beautiful, and it is a good idea to serve this as a “verrine”… Very nice dessert! I’m sure that this lemon curd wouldn’t last long in my house… Lemon flavour with gingersnap cookies I bet becomes a dream in the mouth! Love your curd and gingersnap dessert. It is perfect for casual outdoor entertaining this summer.